The Trail 2: North Corner: stories: Who owns the Walls? 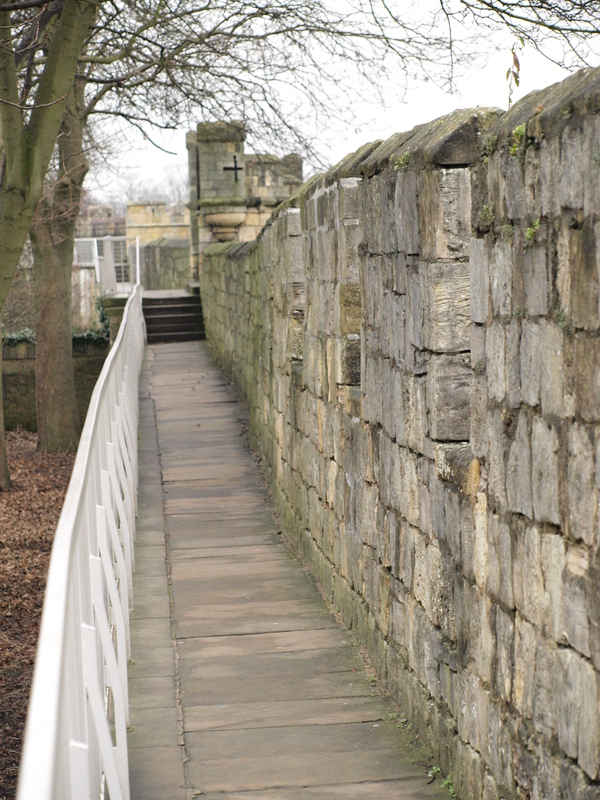 You will be walking on a wall-walk Victorians built, beside battlements they rebuilt on walls that are basically medieval. These walls are on an earth rampart that was started by the Romans but then grew to cover what was left of the Roman walls. This is the Minster corner, look to your right for many glimpses of the Minster and three good views of it. The present Minster took 250 years to build so it has windows of all the three major Gothic styles. First you see glimpses of the “decorated” style of the lovely “heart of Yorkshire” window at the west end and the later, “perpendicular”, style of its towers. 30 metres before you get to Robin Hood Tower [the tower is at the angle of this corner] you have the first good view of the Minster. The simple, spear-shaped, windows in the central, closest bit of the Minster are the oldest ones in the present Minster, they are in the “early English” style of the 1220s. 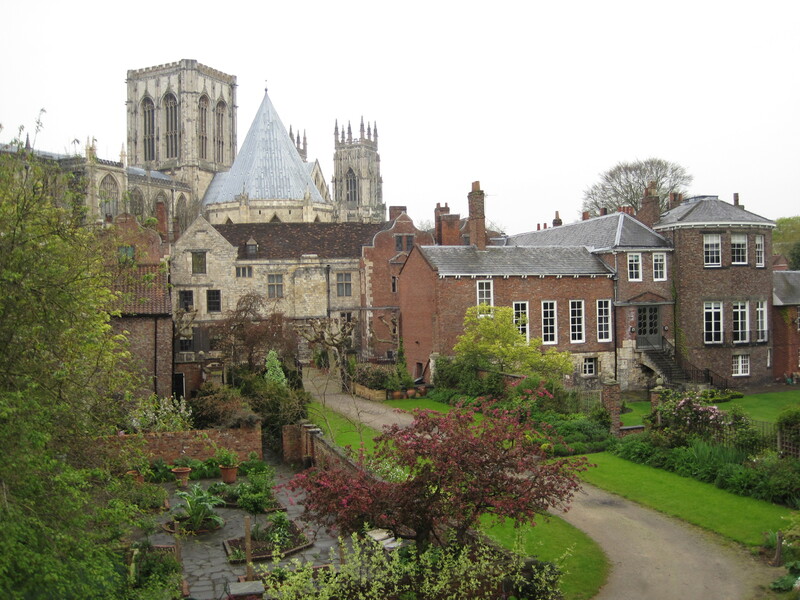 The large garden below you at this point belongs to the dean, she is in charge of the Minster and its grounds. Robin Hood Tower is Victorian. The small slit windows you can see in its battlements could never be aimed out of with any success. This tower has benches and a good view of the next bit of wall and the ditch outside it, this view reminds us that there was once a deeper ditch all round the Walls. 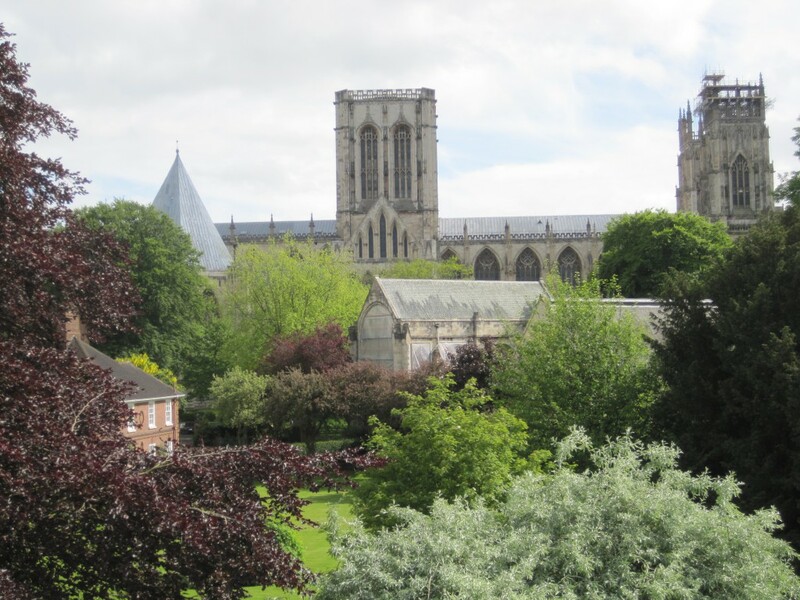 Trees block the view of the Minster from this tower but soon after it some 2014 tree felling has created the second good view of the Minster. The top of the next tower was also built by Victorians –with 2 pretty but very silly, little turrets. About 70 metres further there are steps that just go down to a splendid house and garden, around here the third good view of the Minster starts. The steps lead to Grays Court, a hotel which usually welcomes non-residents to their garden and parlour bar for drinks, teas and light lunches. In the 1880s, the owner of this garden and the dean reluctantly gave up what they saw as “their” bits of the Walls [and a bit of their privacy] to complete the trail you are now on. 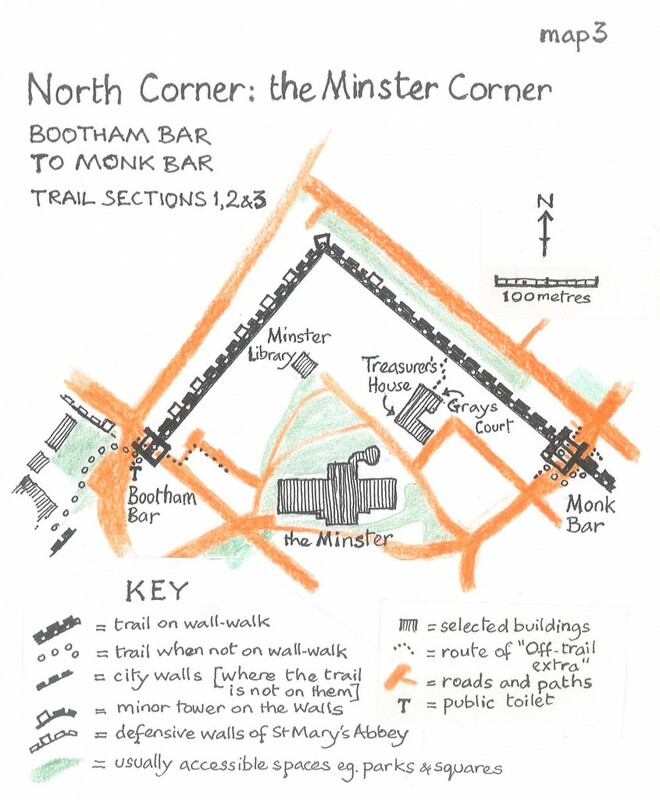 At the end of this corner you see and enter Monk Bar so need to read the basics of this, the next section of the trail. The first part of the Walls here didn’t have a full stone wall-walk in medieval times, it probably had a narrow ledge that could be used to support a timber wall-walk in times of danger. The wall was also defended from interval towers which were higher above it than they are now after the Victorian restoration. These towers were usually open at the back –as their lower versions are now. The towers stick out from the walls so defenders on them could see the sides of those attacking the walls –and deliver what is called “enfilading fire”. The first five towers are relatively close together, perhaps because there was no permanent wall-walk here for defenders. The Victorians built the wall-walk on arches and rebuilt the battlements and sometimes the top part of the Walls. We know that they took advice from experts in medieval military architecture so it is odd that they included features that would have brought problems to medieval defenders. Some slit windows are at the wrong height and some are narrow for the full width of the parapet –so that aiming through them would be almost impossible. Perhaps the rebuilders only wanted the Walls to look good from the outside –or in some places were just cutting corners and in others were trying to entertain. Robin Hood Tower, at the angle of this corner, is a Victorian replacement for a ruined medieval tower which had had this name from about 1600 [unfortunately Robin Hood was a popular folk hero hundreds of years before this and we know of nothing that links him to this tower]. The tower has a carving of crossed keys set into its paving to remind us that it’s close to the Minster [which is dedicated to St Peter who the Bible says was given the keys of heaven]. This tower is all Victorian but sometimes you can see where the medieval stonework ends and the Victorian rebuild or build begins. You can do this if you look at the outside of the next tower –look at it from Robin Hood Tower or, better, from an embrasure just before the tower. The “pepperpot turrets” on this tower seem to have been put on as a bit of fun. This tower also has a bench and what some think is a mason’s mark on its steps, but, like most of the interval towers, it has no name [just a Royal Commission for Historic Monuments number: tower 28]. The wall-walk here may be older than the Victorian one to Robin Hood Tower but you can see a few stones in the battlements that look newly sawn. These were laid during very recent repairs – one [forming the top ledge of an embrasure just before the steps down to Grays Court Garden] is unusually orange, showing how variable in colour magnesian limestone is. A little after the steps down to Grays Court’s garden there is plaque set in the battlements [see “stories: Who owns the Walls?” below]. A little further and there’s an image of a Roman helmet set into the paving of the wall-walk. For the whole of the north corner of the trail you walk along the line of the walls of the Roman legionary fort of Eboracum, this is why you have walked a neat right-angle. 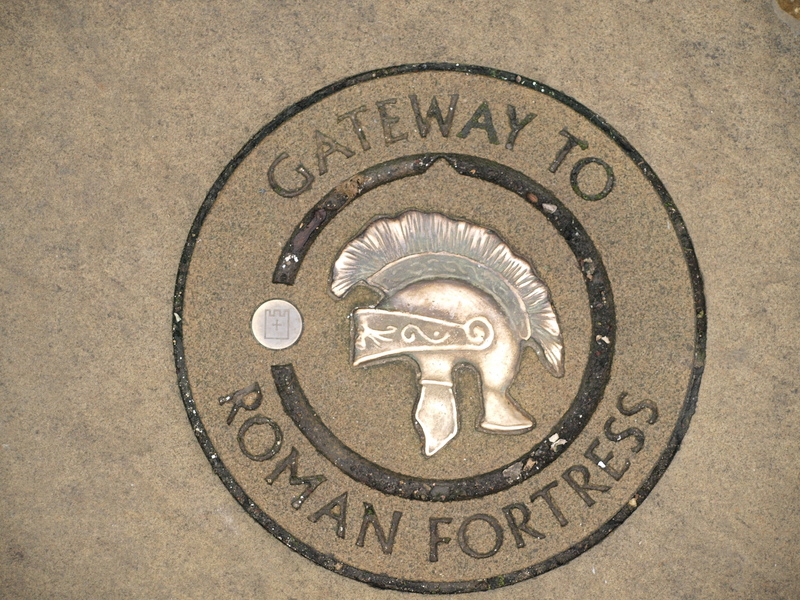 You started at the site of Eboracum’s north-west gate, the helmet marks the site of its north-east gate. It is thought that York’s north-east gate was moved to Monk Bar 700 years ago because Minster priests did not like a major route going through their part of the city. 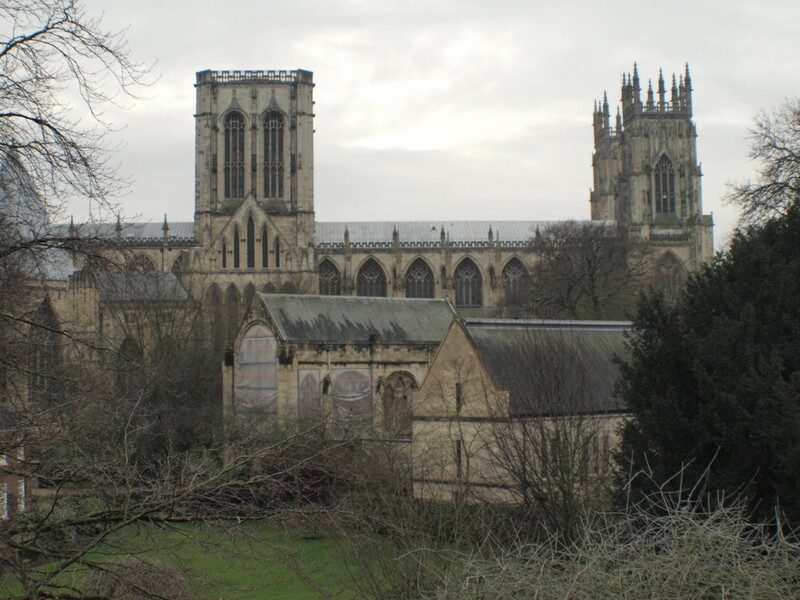 In the first 50 metres: you get glimpses of the top of the great west window of the Minster, it is nick-named the “heart of Yorkshire” because its graceful stone tracery has a traditional heart-shape in the centre of it. More generally the tracery seems inspired by the shapes of leaves a little like those of the ash tree which partly blocks your view for the first 20 metres. On the north side of the Minster [which you will soon see] there are slightly earlier windows where the “decorated Gothic” tracery is very geometric. The bell towers at the west end of the Minster and the central tower were added a hundred years later, so their windows are in the style called “perpendicular” [because of the repeated uprights in the stone tracery, that sometimes make it look like panelling]. After the first 50 metres: as you walk, you can soon look down on a complex, varied bit of open ground where medieval archbishops once had their palace. The inner ramparts here are wooded and look best in May when there are bluebells here. The main thing that is left from the archbishop’s palace is its chapel, now the Minster library, you’ll see glimpses of it to the left of the Minster but closer to you, its back is to the dean’s beautiful big garden; it is linked to a modern building of a similar size, shape and stone which is closer to you, this is its recent extension. The excellent view of the Minster from just before Robin Hood Tower [at the angle of the north corner] is described under “basics”. From Robin Hood Tower with your back to the Minster: to your right, running beside the best bit of town ditch that we still have, is Lord Mayors’ Walk; it was laid out as a paved, tree-lined promenade in Georgian times. 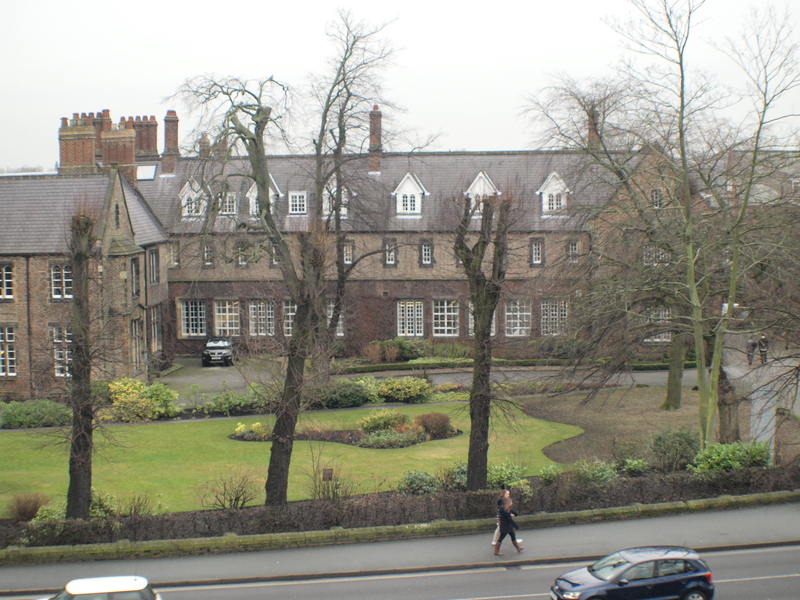 The old-looking building on the far side of this road is not as old as it looks, it was built in Victorian times for a college that has developed into York’s second university. You can see some of the modern buildings of the University of York St John are to the left of its old buildings; if you are tall you can glimpse between the old and the new, almost a kilometre away, the flat roofed, red-brick Rowntree’s sweet factory. Sweet-making, with the railways, provided the main new jobs in Victorian York. This factory is still an important employer in York [still making Polos and Kit-Kat here] but the Swiss international company, Nestlé, now owns what was once a York family firm. From near the Roman helmet in the paving: The view here is interestingly complex but the more attractive view is from about 15 metres back along the trail. Outside the Walls you can see where the route of the main Roman road from the north east survives as a slight dip in the level of the ramparts and then a narrow alley [humbly called Little Groves Lane]. If you look inside the Walls the line of this road runs by the left side of the linked complex of old buildings on your right. These were once all part of the house of the Minster’s treasurer, they are better seen from 15 metres back. There is a small street on this line but only a hint of it can ever be seen from the Walls [through a group of trees that mask a gap in the housing closest to you]; this small street is called Chapter House Street as it runs towards the yard between the consecrated parts of the Minster and its chapter house [its medieval business centre, octagonal with a tall pointed roof]. This street –or rather a cellar under it because the ground level here has risen several metres since Roman times –is York’s most famous ghost site [an internet search for “Harry Martindale” can give you details]. The Treasurer’s House is not an exception, most of the houses you have passed between you and the Minster have housed Minster officials since the Middle Ages [several still do] you can see some old parts of these houses but many of the oldest parts are hidden inside them. If you look along the wall-walk in front of you then you see Monk Bar with its wild men threatening to throw stones from the top of its extra storey. Half-way between Robin Hood Tower and Monk Bar, private steps go down to the garden of Grays Court Hotel. This hotel is described in “basics” and in “Refreshments, Seats & Toilets”. Currently the gate to the steps is usually closed and repairs are needed, but it is hoped it can soon be opened. If the steps down to the garden are closed then the only entrance to Grays Court is at the end of Ogleforth [first right off your road if you go into the city at the next bar, Monk Bar]. 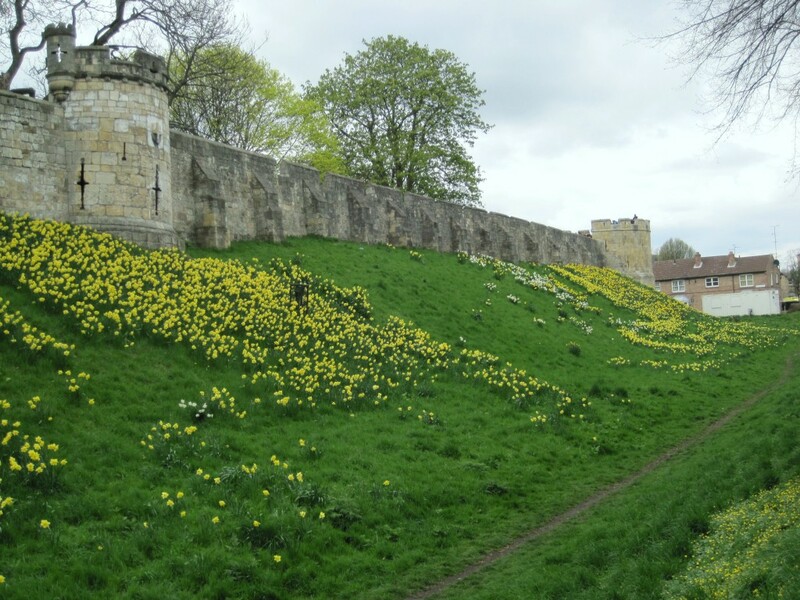 In Georgian times some people started to appreciate York’s defences as romantic ruins, ruins that reminded them of dangers that were gone. 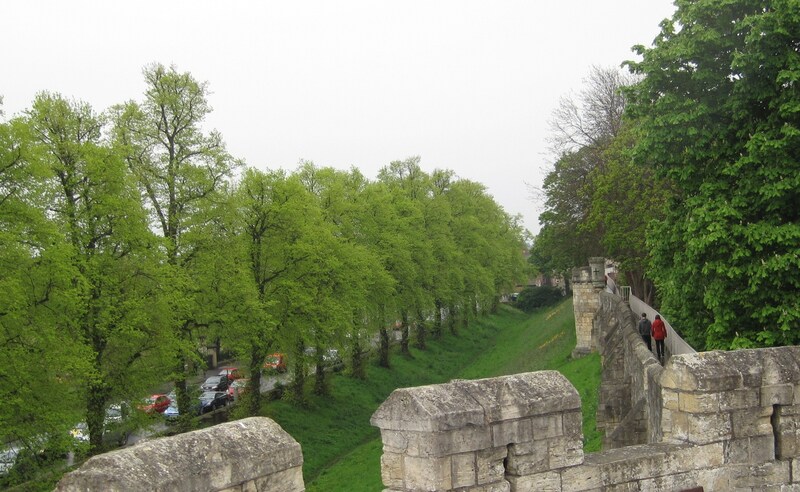 One family bought Clifford’s Tower, York’s big castle keep, grew trees and bushes in and around it and used it as a pretty picnic place at the bottom of their garden. Along the length of the Walls by the Minster people started to feel that “their” bits of the walls were an attractive part of their garden. 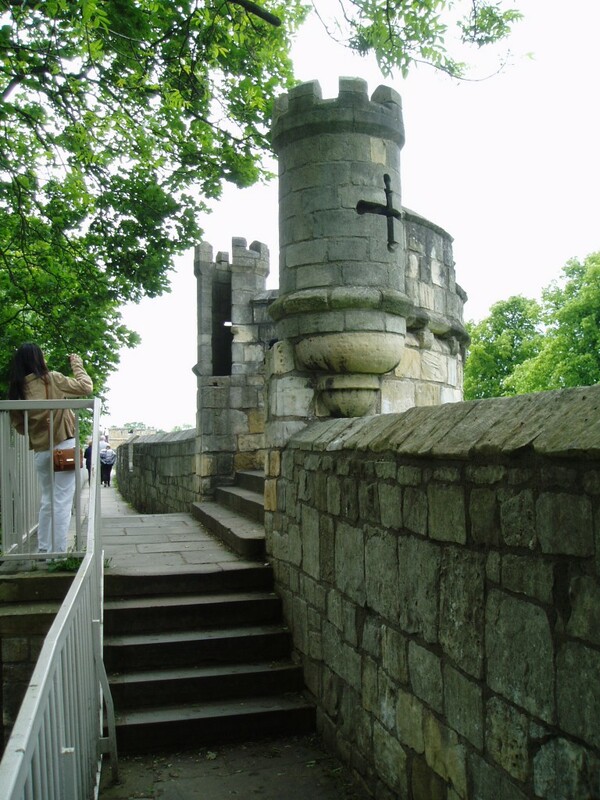 Meanwhile for the Lord Mayor and corporation of York the Walls were often an annoyance, they seemed unsafe and expensive to repair and they made it difficult for carts and carriages to get into York. 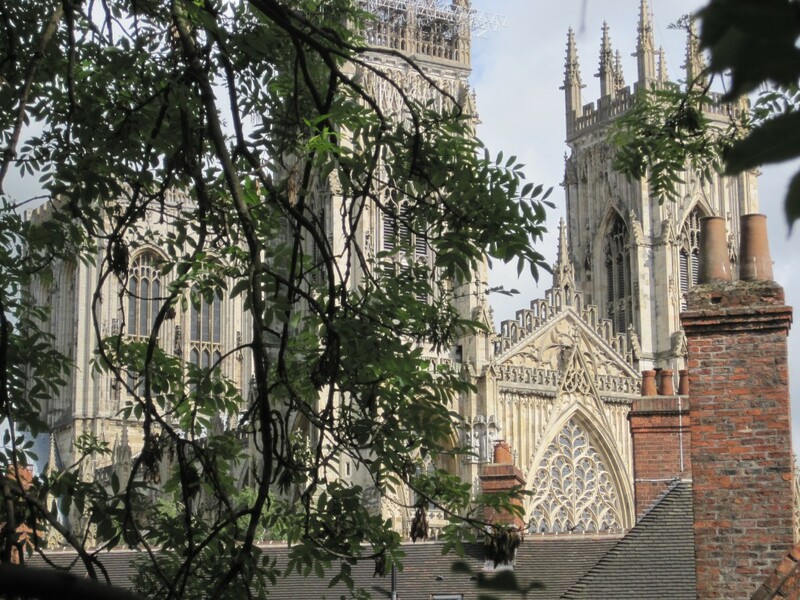 Around 1800 the corporation had a small section in the south knocked down -and the archbishop of York successfully sued them in the law courts [he demanded damages because he could no longer collect tolls when people went through a gate in the Walls to a fair he had the right to hold]. The corporation petitioned parliament to give them the clear right to demolish the Walls but they had no success and a campaign started to save the Walls and create a public path along them. The campaign had its successes and by the 1830s the corporation was knocking down some bits and repairing others. By the 1880s the city’s leaders had a new problem, they had repaired and restored almost all of the Walls but they couldn’t complete the circuit because in this north corner people with interesting ruins at the bottom of their private garden did not want their romantic garden feature transformed into a newly repaired wall, certainly not into a wall with a walk-way from which the public could stare down into their once-private gardens. One of the gardens belonged to the dean and another to Edwin Gray who was the son of a Lord Mayor and was a lawyer; he said he would sue the city leaders for trespass if they tried to touch “his” Walls. However, somehow by 1887 a deal was done, the Walls were restored to the city and restored to a good state of repair, a public footpath was established along them. A plaque placed on the Walls by Grays Court just hints at the conflict involved. The hint is so subtle that one website currently tells visitors that the “awkwardly worded” plaque is to tell us that Edwin Gray is to be remembered for helping to get the Walls restored. 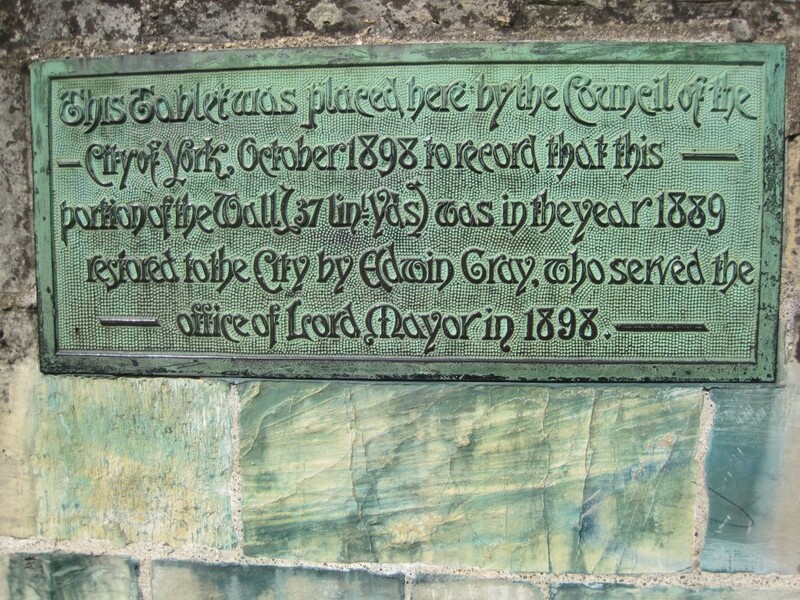 Edwin Gray was made Lord Mayor of York a few years after the restoration.